Q: When am I eligible to start receiving my retirement benefits? Q: How do I receive a Credited Service Credit? A: You must have at least 250 hours during the Plan Year to receive 1 Vested Service Credit. Q: What are the breaks-in-service rules? A: As of January 1, 1985, you will have a permanent break in service if your number of consecutive one-year breaks in service equal or exceed the greater of five years or your number of years of Vesting Service or years of Credited Service, whichever is greater, unless you have obtained a vested right to a pension. Q: What payment options are available for my Pension? 50% Joint and Survivor Benefit: You receive a reduced payment for your lifetime and upon your death, your spouse will receive 50% of the benefit for the remainder of his/her lifetime. 75% Joint and Survivor Benefit: You receive a reduced payment for your lifetime and upon your death, your spouse will receive 75% of the benefit for the remainder of his/her lifetime. 5 Year Period Certain Benefit: This provides a lifetime benefit for the participant. If the Participant’s death occurs before the end of a period of five years, the balance of the annuity payments for the certain period shall be paid to his named Beneficiary. 10 Year Period Certain Benefit: This provides a lifetime benefit for the participant. If the Participant’s death occurs before the end of a period of ten years, the balance of the annuity payments for the certain period shall be paid to his named Beneficiary. Q: When can I access my benefits? A: As long as you are no longer working in Disqualifying Employment, you can work and receive your pension benefit. If you work in Disqualifying Employment, you need to contact the Administrative Office regarding the suspension rules. Q: What is Disqualifying Employment? A: Disqualifying Employment is employment or self-employment that is in an industry covered by the Plan; and in the geographical area covered by the Plan, that is the accumulated jurisdiction of all the Unions participating in the Plan; and in any trade or craft that is currently covered by the Plan. Q: When will my Benefit Payments end? A: Your pension payments will be last payable for the month in which your death occurs, except as provided in accordance with any survivor benefit payable under the Plan. A: Make sure you entered your account name and password correctly (case sensitive). A: You will first need to log in using your authentication code, similar to a pin#. 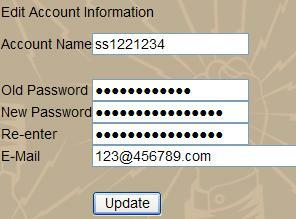 After logging in, create a new username and password to personalize your account. You can then log in with your new account.